I love to collect anything about inspirational project that use recycle material and turn into any useful stuff for our lives. 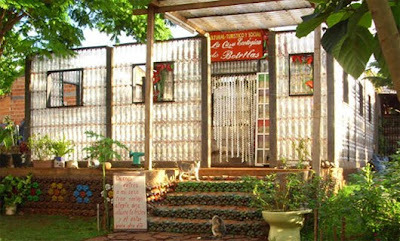 Its an awesome project that was called “Casa Ecologica de Botellas Plasticas” means an environment-friendly house that was made from thousands of PET plastic bottles and intended for promoting ecological and social responsibility. Created by the Alfredo Santa Cruz family in Puerto Iguazu the La Casa de Botellas is a comfortable eco-friendly living space, and its a great ideas on how to use the recyclable material such as plastic bottles into usable stuff, if you have may plastic bottles, you can use it to create a meditation room or small living space into your backyard, and off course its better if you built these house under the shade tree, so it will protected from the sun. 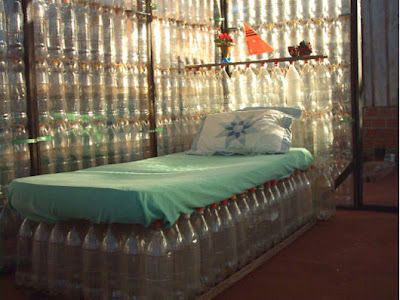 Let’s see the photos and think how many plastic bottles to built this home.